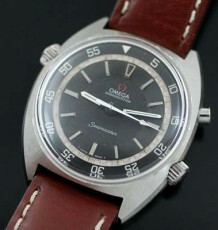 Omega automatic wrist watch, vintage model. 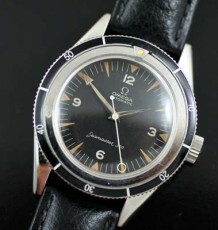 Highly unusual and large solid Silver ladies wristwatch from the high style of the 1970’s! 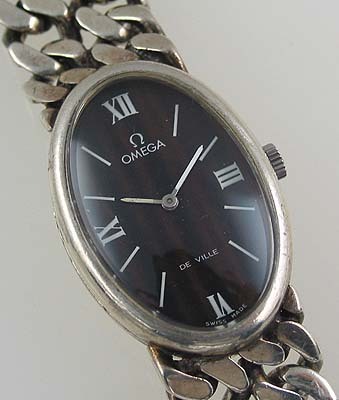 The watch features a very heavy sterling silver case, ref 8348, hallmarked .925 and a banded brown mineral pattern dial with white Roman numeral markers. 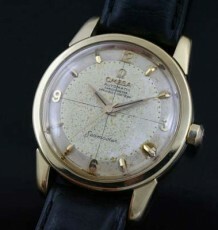 The watch is fiited with an Omega manual wind caliber 675 movement. 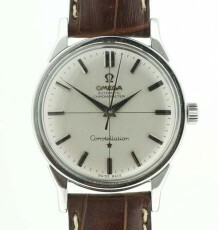 The watch measures 23mm wide by 33mm long and is fitted with a genuine Omega integrated solid silver chian style bracelet, which is long enough to fit a 6.75 inch wrist.